I’ve gotten a few questions about what we should be doing once 5.0.4 goes live on Tuesday, so I thought I’d put together a quick FAQ on preparing for the patch and offer my thoughts on the changes that you will be faced with. I’ve already talked a lot about the talent trees in other posts, so I’m not going to go into too much detail again here. I will say that you should explore the other options in the 45 and 75 tier if you haven’t had a chance to play around with them on the beta. I would also encourage you to play around with the level 60 talents to get a feel for them as well if you haven’t been on the beta. However, when push comes to shove, these are the talents that I think will work best at level 85 for our last few weeks of Cataclysm. What haste breakpoint do I need? Since we are still at level 85, our haste breakpoints will remain the same. You will still want to have 2005 haste. Keep in mind, however, that you will be losing your idol. So if you had any haste on your idol, you will want to be sure to find somewhere to reforge or regem so that you are at 2005 again. Do I really only have 100k mana? You do! You will also be losing revitalize as a source of regen and intellect no longer has an effect on your mana pool or regen. From my play on the beta, I think that you will probably feel the pinch a little, but not an extraordinary amount at level 85. If you find that you are running out of mana too quickly during encounters try backing off of your rejuv use some. If that still isn’t sufficient, reforge some of that spirit back onto your gear. I ran at about 2600 spirit at level 85 on the beta, so if you are one of the players who dropped down below 2000 you will likely want to reforge some of that spirit back before stepping into your first post-5.0 raid. So what, exactly, does Intellect do now? Intellect will continue to give you additional spell power, as well as increase your critical strike. What do I use for regen? Spirit will be your new regen stat. As you move into MoP you will need to find a balance between spirit and intellect that feels good to you, and will be subjective to each player. I don’t think you will need to make drastic changes at 85, but if you are running with an exceptionally low amount of spirit, you may find that your mana cannot keep up with the way that you are used to healing. Will my Stat Weightings Change? Outside of perhaps wanting to add more spirit if you are low in that area, your stat priorities will remain largely the same at this time. What Glyphs Should I Use? For major glyphs, I have been favoring: Regrowth, Wild Growth and Lifebloom. If you are uncomfortable with the change that the Regrowth glyph brings to Regrowth, I’d recommend using the Rejuv Glyph. With Rebirth at a baseline 60% now, you no longer need the rebirh glyph as a “must have”. For minor glyphs, the world is your oyster…or something like that. Pick whatever you want! I like the orca and stag glyphs quite a bit! What about this new Iron Bark thing? Use it, love it, keybind it! It’s on a relatively short cooldown, so I would recommend using it often and not waiting for the “perfect” time. I would recommend making a power aura to remind you when it’s available. Additionally, don’t forget that you retain barkskin and they do not share a cooldown. Mushrooms are here to stay. My recommendation is to get used to using them by finding ideal time in your raids to both plant them and explode them. Jasyla has a list of recommendations for where she thinks mushrooms will work well in DS. Explore them, and make a decision on how you feel they work for you. Make sure to set comfortable keybinds for both placing and detonating your mushrooms. I personally have my drop mushrooms keybound to “shift-r” and my detonate to “shift-t”. I’m not saying you should use those exact keybinds, but with the way you must target placement of mushrooms, I do strongly encourage you to have it keybound. What about Lifebloom and Harmony? Both of these abilities have had their duration increased. Lifebloom is at 15 seconds and you only need to activate harmony once every 20 seconds. You may find yourself refreshing the abilities long before it is needed, out of habit, but with proper tracking of them I imagine new habits will be formed. Yes! However your dispel is now on an 8 second cooldown. You may want to consider making an aura for it. But how will we be able to kill Spine or Sinestra?! Don’t worry! Blizzard has already thought of that. The debuffs on Heroic Spine will turn into the “friendly” debuff after only one cleanse (which will make it more challenging to get onto your tanks – so you may want to anticipate them taking more damage). For Sinestra, each time you cleanse wrack your timer on cleanse will be reset, so nothing will change about the cleansing aspect of this encounter. Will the way I heal change? Largely you will heal the same way. Our core toolkit has not changed much at all, and so the way that we heal remains very similar to how it is currently. You will want to try to work in mushrooms and if you find that you are struggling with your mana, you may want to use rejuv a little less. But largely I think you will feel fairly comfortable with your toolkit post 5.0.4. If you are like me, you probably have a bajillion of them! While you will be on your own to update them, I would recommend checking WoW Interface and WoW Ace for updates regularly during the first week that 5.0.4 is live, as many addons are updated almost hourly after a big patch release. There were a lot of changes going into MoP, so it is likely that you will need to update every one of your add ons on Tuesday. Do not be overly afraid of recently updating beta listings on WoW Ace or Curse Forge if it is the only thing available for that addon. I will say that a majority of the major addons had mostly working beta versions of their addons available during the beta. To ease the great addon rush, I would recommend going through your AddOn folder and deleting any addons that you do not use anymore. Once that is done, I would write down all of the addons that you need to update on a sheet of paper so that you can make notations about the addon as you update them. Additionally, I would recommend creating a new download folder specifically for addons you download for this patch (mine will be called 5-0-4). Last but not least, don’t panic if your favorite addon isn’t updated yet! Keep checking, and read through the comments for the addon; frequently the author will leave a note there, or other users can help direct you for where to find a working version. I think that covers just about everything! If I’ve forgotten something, or you have additional questions, please don’t hesitate to let me know. How much spirit are you going to have Beru? I’m trying to think of a decent number to reforge back into. I was running about 2500-2600 on the beta at level 85. I will probably start there on live, run an LFR on Tuesday to see how comfortable that feels, and then adjust up from there if I feel it’s needed. Interesting talent choices. I do plan on taking Nature switfness as well. My first choice would be wild charge over Feline Swiftness. Wild charge will be very handy on heroic madness and on ship especially when I have a partner or 2 to soak purple circles on ship. About 50% of times either my partner or I have failed one another on ship. He’d die or I’d die because neither of us would run fast from left to right. On down side for me, I am atm the only restoration druid on my 25 man team and when we lose a tank on ship/spine/madness (heroic) I am first one my raid leader calls out to br someone. He always saves my “good” br to get a tank up. Last week both of our tanks got crit on heroic Spine for 380k each. There was nothing that could save them. I had to use my good br and my raid leader asked me to keep it thus my hps will probably suffer. Incarnation is now an option to have tree of life form or not but 15% improved healing is a big plus I think. Forces of nature summons 3 torrents who cast healing touches. Again I don’t know if they’d be healing random targets or same target. I haven’t had a chance to try it on beta. Keep in mind that Forces of Nature = 1 min cool down vs Incarnation aka tree of Life = 3 min cool down. Don’t know yet which one is better. 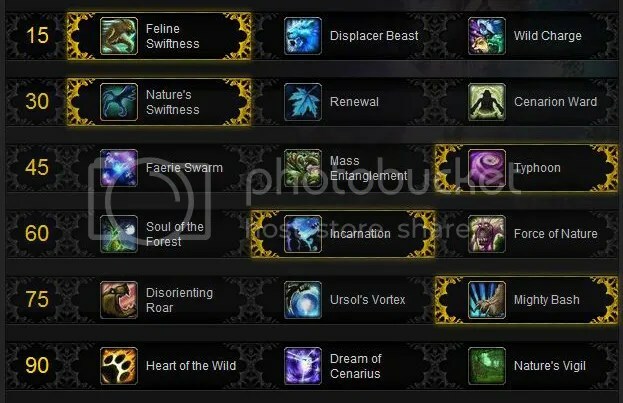 With Forces of Nature talent it makes me think now that Blizzard wants to make druids viable tank healers. Not that I couldn’t keep my tank up before on Heroic Nef fight, i did just fine, but now with Lifebloom jumping at 3 stacks to another target is interesting concept for double tank healing. Beru, when you say you were using 2600 SPR in Beta, are you including the SPR increase from your Heart of the Unliving trinket or is that just your base Spirit? That is just my base spirit.